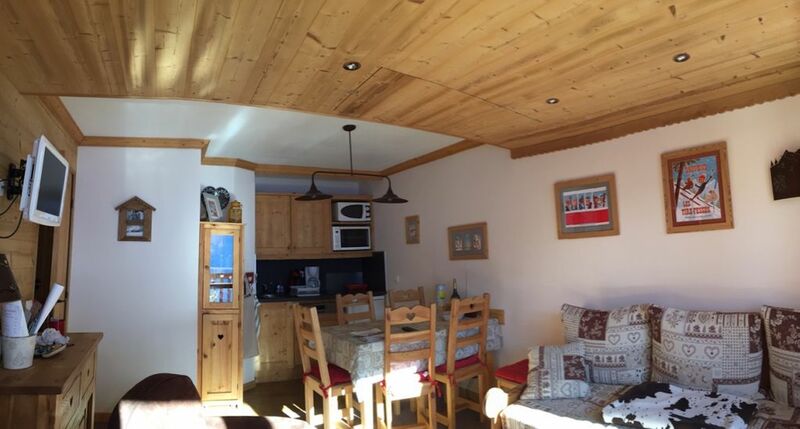 (Text automatically translated) Ideally located on the slopes, duplex apartment renovated very quiet with neat the center of Paradiski area between La Plagne and Les Arcs decoration. Located on the top floor of a "Rummy" building, this apartment is facing south away from the nuisance sonores.Depuis ski room, access along the residence provides direct access to the track you want Montchavin.Si go to other sectors (central station, other departures tracks, a navettes'arrete regularly to ski back to the apartment to résidence.Le is passable throughout the winter. For children, the residence is near the ski del'école Evolution2.Le cleaning is done on weekends and rent sheets and towels are available. Reservations bread and pastries without leaving the house every morning.